Rigid ASSEMBLYs should meet both existence and identity requirements. Most real objects are compact solids and one manifestation of this is connectedness of all object surfaces. Hence, surfaces composing the object must somehow be directly or transitively connected to each other without using unrelated surfaces. Unfortunately, it is difficult to always determine if two surfaces are directly or indirectly connected. 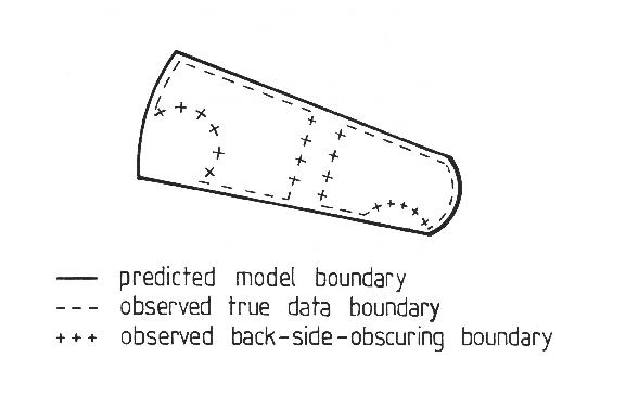 Convex surface orientation discontinuity boundaries definitely mean connectedness, but concave boundaries are ambiguous regarding surface connectivity. Because of self-occlusion, direct connections may not be visible, as when one subcomponent overlaps another. Finally, obscuring objects can prevent observation of adjacency, though surface reconstruction (Chapter 4) eliminates some cases of this. 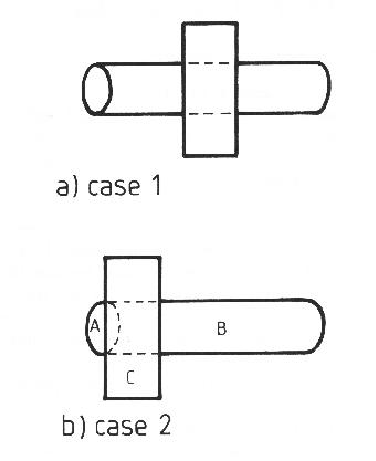 Other cases, like that in Figure 10.3 are not solved by this. Then: the hypothesis is incorrectly formed. This test rejects the false cube seen in Figure 10.1. For rigid objects, the essence of identity is shape, and surface images make this information directly available. Given the surface image, the observed shape could be compared to that of each object from each viewpoint, but this approach is computationally infeasible. A more parsimonious solution follows, which also considers weak segmentation boundaries and occlusion. Intuitively, correct object identification is assumed if all the right structures are found in the right places. Given the connectivity guaranteed by the above test, merely having the correct components is likely to be adequate, because the subcomponents of most objects only fit together rigidly and completely in one way (disregarding highly regular objects, like blocks). But, because there are likely to be a few counter-examples, especially with symmetric objects and misidentifications of similar surfaces, geometric, as well as topological, consistency is required. The requirement of consistent reference frames will eliminate many arbitrary groupings (and was demonstrated in the previous chapter). Surfaces that are connected according to the model should be connected in the scene. This does not always imply adjacency is observable, because object boundaries are not visible from all viewpoints. Occlusion affects verification because some surfaces may be partially or completely missing or a surface may be broken up by closer surfaces. Moreover, true surface boundaries may be obscured. The remaining true surface boundaries will be connected to back-side-obscuring boundaries in different locations. Since these are not model features, they are ignored. [ ] - Each data subcomponent can have at most one visible forward-facing model subcomponent paired with it. (The converse may not hold because of fragmentation or occlusion). [ ] - The position of observed subcomponents relative to each other is as predicted for the corresponding model subcomponents. [ ] - Model subcomponent adjacency implies data subcomponent adjacency and vice versa. For each there is at most one corresponding . [ ] - the back-side-obscuring boundary should lie inside the image region predicted for the SURFACE. Alternatively, the predicted image boundary should lie on or outside the observed image region. Figure 10.4 illustrates this. 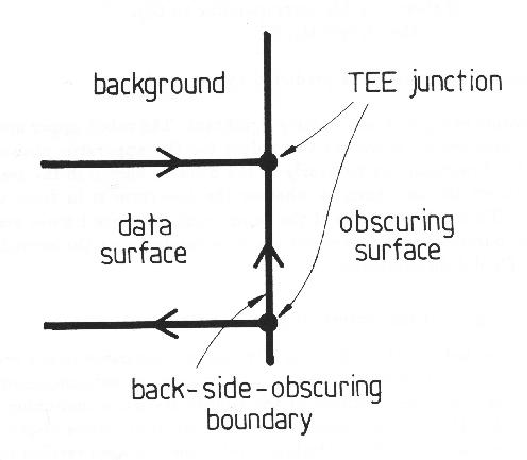 [ ] - Back-side-obscuring boundary segments that bound the surface image region must end as the crossbar of a "TEE" junction. This implies that there must be at least three image regions at the junction. Figure 10.5 illustrates this. [ ] - A non-tangential image surface should be predicted as partially self-obscured during visibility analysis (Chapter 9) if and only if the corresponding data surface has at least one back-side-obscuring boundary whose closer surface is also an object surface. Constraint was not applied because parameter estimation errors made it difficult to check this condition reliably (e.g. predicted model and data surfaces did not overlap adequately). Constraint was guaranteed assuming image labeling was correct, which was the case here. front( ) holds if model SURFACE is directly or indirectly in front of . This is found by raycasting and taking the transitive closure. Then: the self-occlusion is as predicted by the model. One application of was particularly significant. The robot upper and lower arms are nearly symmetric, so there are two values for the upperarm position and joint angle where the lowerarm can be nearly in the position shown in the test scene. The difference between the two cases is whether the lowerarm is in front of or behind the upperarm. Though the depths of the component reference frames are different in the two cases, parameter tolerances did not completely reject the second alternative. Happily, test did discriminate.